Evocative soundscapes... Stunning Chandos recording... These are flexibly organised single-movement structures that display strong and postive links with the great 19th century tradition of the programme symphony and tone poem... Guy Johnston is a technically immaculate soloist, while Rumon Gamba with the BBC Philharmonic are excellent throughout in first rate recordings. ...creates something distinctive out of the contrasts between dance-like exuberance and soulful lyricism. ...an evocation of light, sky and an underlying sense of the transcendent. ...a dramatic and engaging fantasia. 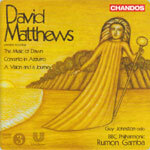 David Matthews... has composed symphonic poems evocative of sensuous nature, the music with antecedents from Richard Strauss and Ravel to Sibelius and Michael Tippett. A 27-minute masterpiece, "Music of Dawn" ravishes the senses, the feel of rising light inspired not only by nature but by painter Cecil Collins' depiction of it. The brass are waves of warmth, the strings rushing atmosphere, the percussion an exotic sizzle -- all combining in a final blaze of gold. "A Vision and a Journey" is a roiling orchestral fantasy, and whether agitated or in repose, the imaginatively scored cello feature "Concerto in Azzurro" vibrates with blue-hued lyricism. Everything is as beautifully played and recorded as one could imagine.